You guys. This is like the BEST frosting I’ve ever made. So good that I just had to share it with you. Initially, I wasn’t even going to share this recipe with you. I made it to frost a chocolate cake that I made. But when I tasted this frosting, I was like WHOA. That’s some good schtuff. So here we are today, talking frosting and all things sweet. Which is ok with me. It’s Thursday. Tomorrow is Halloween and on Halloween, tons of sweet things are enjoyed. I’m one of those people who can eat frosting with a spoon. Actually, I can eat a lot of things with a spoon. Peanut butter. Cake batter. Brownie batter. Mmm. Tonight I will be dreaming of eating all of these things with a spoon. Sweet dreams, my friends. Sweet dreams. 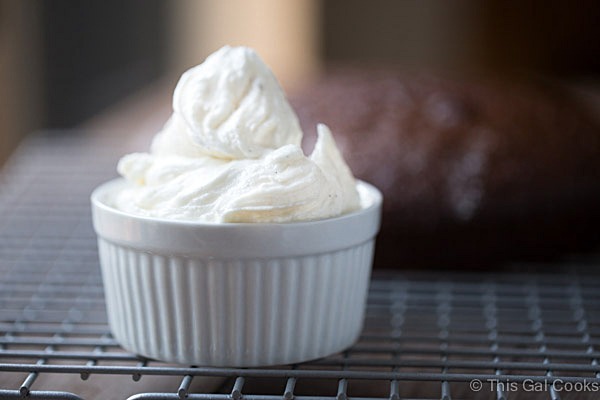 This frosting is probably one of the simplest things you’ll ever make. You’ll never buy prepackaged frosting again. I haven’t bought it in years. For all of you Publix cake fans out there, this tastes very similar to the Publix buttercream frosting. This recipe makes about 2 1/2 cups of frosting but if you need more, you can easily double the recipe. Store any leftovers in a refrigerator for 3-5 days. Enjoy on other baked goods or simply eat with a spoon. Enjoy the recipe. Slice the vanilla bean down the middle and then pull apart to open. Scrape the insides from the bean and set aside. 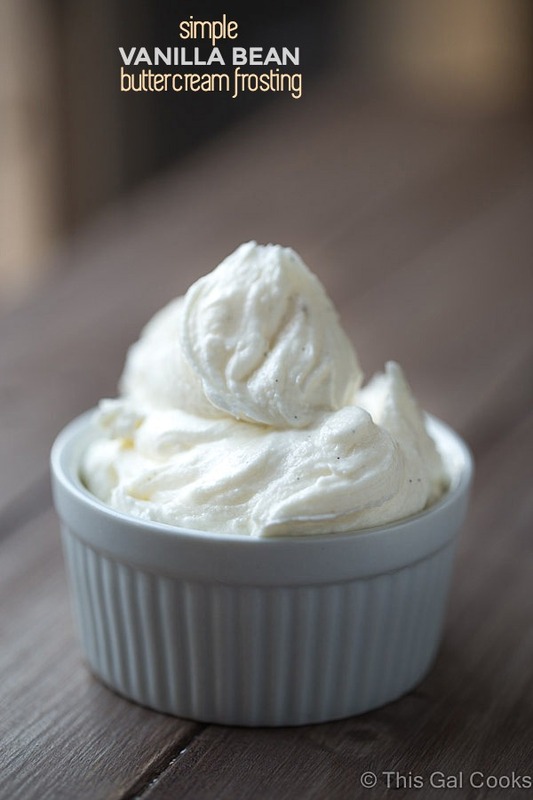 In the bowl of a stand mixer with the flat attachment, beat the butter and shortening until smooth and creamy. Beat in the vanilla bean. Gradually add the confectioners sugar and beat until well incorporated. The mixture will be very thick and dry. Beat in the half and half. Store any unused frosting in a refrigerator for 3-5 days. Try these recipes made with fun frosting. Spiced Apple Cupcakes with Maple Marshmallow Frosting from Blahnik Baker. Orange Cake with Cool Whip Pudding Frosting from Call Me PMc. 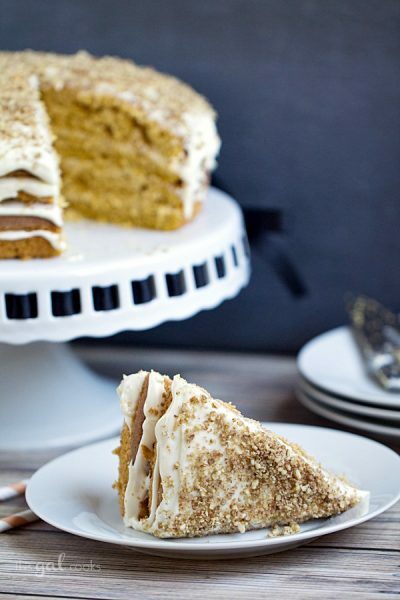 Banana Chocolate Chip Cake with Nutella Cream Cheese Frosting from Frugal Foodie Mama. It looks like a fluffy cloud! Haha. It’s so pretty!! I loooooove Publix cakes. I didn’t know that was a thing and that they’re was a Publix bakery following, but count me among them. Their frosting is phenomenal!! I love their cakes! I will have to try this next time I make cupcakes. Thanks, Julie! Oh yeah, definite Publix Bakery following and a Publix Sub following, too! Their cakes really are the best, too! Thanks for stopping by, Sarah! So simple but so fancy, sometimes the best desserts are those made with a delicate vanilla frosting. You’re right about that, Catalina! Thanks for stopping by! I love surprises like that! Like, you know it’s good, but then it’s REALLY good. The texture of this frosting looks incredible! The lighting for these photos is fantastic as well. Pinning this one Julie! Thank you so much, Mary Frances! Oh I just want to swim in this!! Using shortening is such a great idea…a more stable frosting!! 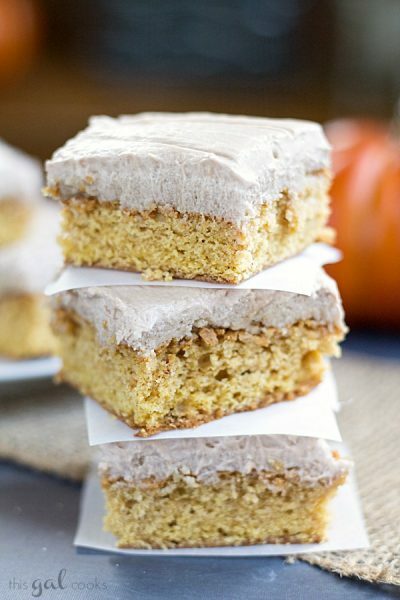 I love how you can see the vanilla beans in this yummy frosting! Thumbs way up! You use the insides that you scrape out in the recipe. Those are the little vanilla beans. Is this safe to set out at an event, such as a wedding, with the butter and half-and-half in the recipe? Thanks! It should be. I’ve iced a cake with it and left the cake on my counter for a few days and all was well. However, if you want to play it super safe, you could always keep it chilled until it’s ready to use. Hope this helps! I just found your Site, it’s wonderful. Your Dog is adorable. I just finished Baking a Chocolate Cake and was looking for a Vanilla Frosting, as this is my favorite. 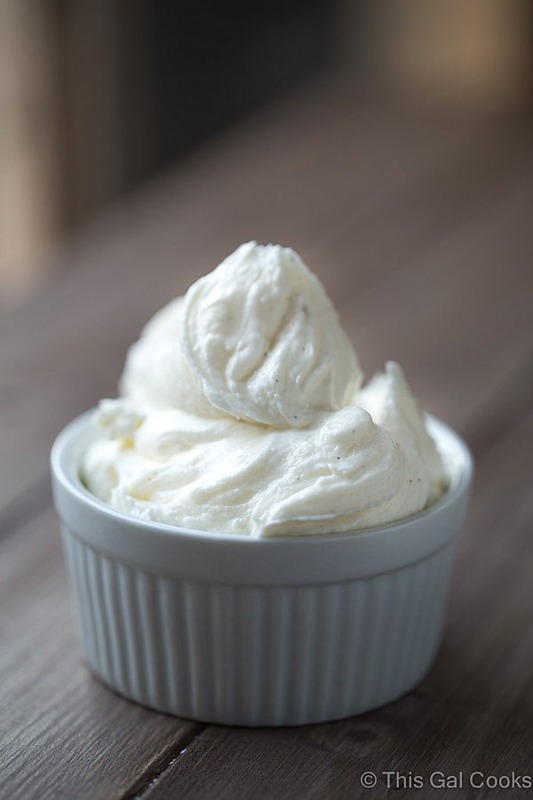 I can’t wait to try this Vanilla Bean Frosting. Hi there! I write to you from Romania and I have a question for you. What does does it mean that “half half “? I really like your recipe and I want to try it. Anyway..congratulations for all your work!!! ANything I can do to cut down the waxy feeling in my mouth from the crisco?